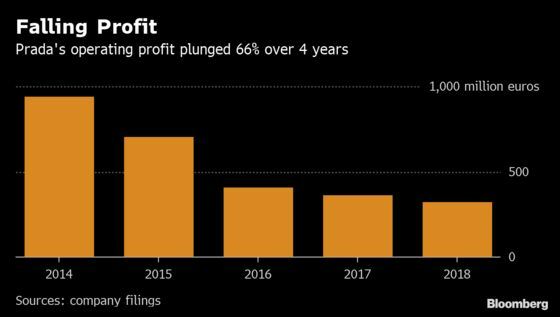 (Bloomberg) -- Prada SpA shares fell to the lowest close since 2016 as slower Chinese spending contributed to an unexpected drop in the Italian fashion house’s annual profit. Kering shares, which have bounced back since jitters over the state of the Chinese consumer emerged last autumn, were up 0.6 percent early Monday in Paris. Louis Vuitton owner LVMH was down 0.3 percent. Prada’s operating profit declined 10 percent to 323.8 million euros ($366 million), falling short of the 378 million euros predicted by analysts. The shares slumped 11 percent in Hong Kong on Monday, the biggest one-day drop since September 2017. The stock has lost 38 percent over the past year. Prada has seen its earnings tumble for four straight years, falling more than 50 percent since their 2014 peak as the group raised handbag prices and took too long to come up with products to follow up its best-selling Galleria line. This year, however, revenue returned to growth as the brand rolled out new handbags like the $3,000 Sidonie shoulder bag and fresh shapes in its more affordable black nylon that helped win the favor of younger shoppers. But the cost of investing in e-commerce and social media as well as staging pop-up stores and parties to reignite interest in the brand all incurred additional costs.